Annie-Mation: My own personal.... Serial killer? My own personal.... Serial killer? WEE!!! 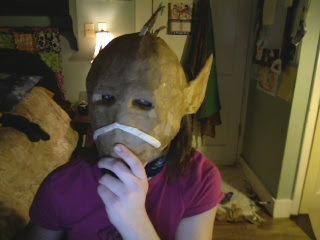 Okay so this is a process picture of the mask I'm working on for my 3d design class. Pretty much, we had to take a human frailty and then design a bit of armour to protect against that human frailty. I didn't Exactly focus on a frailty, i more tried to make it how I feel when I'm at home. Its a very snug fit, almost claustrophobic (Especially now that its shrunk a wee bit), there's no actual expression on it, and the mouth is covered (I can sound like Darthvader when I breathe), because when I come home, I'm afraid to really say anything cause it always comes out wrong and ends badly. It's also something I figured represents the lack of creativity I feel while I'm here. Feels like I'm smooshed between the pages of a book. 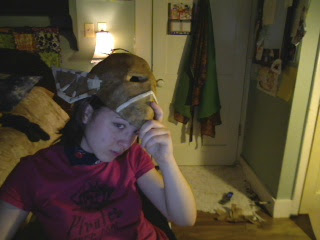 I gave it large bat-like ears to represent that I really have to learn to listen (i.e. think) before I speak, and the fact that really all I'm ever expected to do is sit around, listen and do what I'm told. Gave it some fishy/spike dealys kinda like a lionfish just for an added element of needing to look more threatening/bigger as a defense mechanism. Gonna add some fun textures to represent the want to blend in/melt away, another defense mechanism. I'm obviously not going to say that to the class XD Going to invent some kinda frailty. Gotta think about that =P But yeah, I'm almost finished covering it, then I can start putting in the details and having fun there. Anyways, gotta get back to work, and the brother wants to borrow my WoW.